What role does accurate measurement of your heart rate have when training for and running ultras? Well, there is a well known saying doing the rounds amongst us to signify when we are writing cheques our body can’t cash and that is “Don’t go into the RED ZONE” or alternatively “Don’t take too many cookies from the jar” ! How do we know we are entering this zone, well the breathing is heavy, the legs are on fire and you can feel your heart trying to escape through your ears! Most of us know this feeling and the consequences of dipping into this zone too often and sneaking one too many cookies can make even the shortest of training runs end up in an almighty KABOOM. One device we use regularly to get a better feel for our training is to utilise a Heart Rate Monitor or HRM. I for one feel these devices are especially valuable when looking at the potential for overtraining and impending illness along with the ability to measure recovery rates during intervals and between runs. 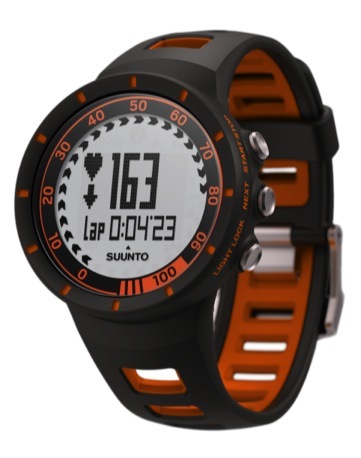 Our latest addition to our ever growing stable of gear and gadgets to play with is the recently released Suunto Quest Heart Rate Monitor. The package we received courtesy of Suunto Australia was the Quest Running Pack which includes the watch itself in a vibrant black and orange, a comfort fit heart rate monitor belt, mini movestick (USB) to synch the device to your computer and their proprietary on-line community called Movescount and a footpod to help measure distance. Straight out of the box, the first thing you notice about the watch is how lightweight it feels. I suppose a number of us who regularly wear GPS enabled watches are used to the necessary bulk these devices come with due to the extra technology inside. This is definitely not the case with the Quest. Secondly, there is a certain feel to the watch that exudes high-end build quality. As with all Suunto devices, durability is top of the list when it comes to creating an aesthetically pleasing watch that will still look good in years to come regardless of the hammering it will get. The Quest is no different here with clean lines but bomb-proof construction in all the right places. This watch is firmly positioned as an everyday functional sports trainer with a no nonsense approach to recording the basic to intermediate data your weekend warrior to budding pro would require with minimal set up all captured on a big, easy to see display. There are only three buttons on the watch, Start/Stop, Next and Light/Lock. These three buttons allow you to enter into 8 different sub folders including training, set up pages, training archives, device pairing and internet synching. One nice feature is the ability to tap the screen when out on a run to record a lap. This is ideal when you are pushing hard and don’t want to fumble for a button. In addition, you can set the sensitivity of the buttons which is very useful when wearing long sleeves or gloves. On my first run, I used the watch with HR belt and attached the mini footpod to my road shoes and took it for my typical trip around Sydney harbour. Activating the watch was easy and by selecting the training page, it automatically detected the HR belt and footpod simultaneously in a matter of seconds and I was ready to start running. I have not used a watch with footpod before and this is an interesting point to note when comparing to a GPS which can take a few minutes to locate the satellites, this watch was ready to go straight away. This loop is 12kms of undulating concrete and bitumen with some tall buildings and tree cover as measured by my Garmin FR610 and 12.6kms when measured on MapMyRun. I decided to see how the watch performed with no custom set up including no calibration of the footpod. The information available on the screens toggled by the middle button, gave me all the basics, time, exercise duration, speed in real time, pace, distance, heart rate and %HR to Max. The display was big enough to see the primary data in the main screen with secondary data displayed slightly smaller below. This is ok if you only want the basics, but some watches allow up to 4 different sets of data to be displayed on the single screen. At the end of the run I measured 13.1kms from the footpod, which seemed a little long. Next stop, a 400m oval to calibrate the device as per the advice of the user guide. Again this is easily done after a few laps of constant running I set the watch to what I thought was a more realistic measure. Unfortunately over the last 3 weeks of using this watch every day, it continued to measure long when compared to my Garmin GPS on my road runs, the only anomaly being comparisons on the trail. Here it seems to under measure by about 2-3% when compared to the GPS. Again this inaccuracy is based on the premise that a GPS is 100% accurate, which we all know is not the case due to shadows created by trees, tall buildings and canyons. In order to get some better comparisons I decided to wear my Garmin FR610 and activate the GPS and compare time, distance and speed at the same time. This is where I started to get some funny looks as I regularly left the house wearing two watches, starting and stopping them both at the same time. My takeaway from this, without sweating it too much, is get it within 2-3% accurate and then stick with the one device for all runs, so you can compare progress relative to your last run as opposed to other devices. At the end of the day, most people wanting to buy this watch will be training for something akin to a marathon or similar other race and so have a set program which will often repeat the same run several times with the aim of getting faster, this watch will certainly aid this progress with more than enough information at your finger tips to analyse. I must admit, the footpod mini is an impressive little bit of kit, weighing only 10grams and a battery life of over 400 hours makes for a very unobtrusive way of getting a measurement of your distance and pace. Problem is, I have too many shoes on rotation so need to remember to attach it each time I swap shoes. There is not much to say about the heart rate monitor, the belt is soft and so is easy to wear, with little to rub or chafe even when wearing a backpack. Its easy to clip on and off, with the join in the middle of the transponder itself. Similar to belts by Polar and Garmin, it is washable and fully adjustable. So what are the features that make this watch desirable and definitely worth considering adding to your ultra running gear list. The Suunto Quest connects to your computer with the optional ANT Stick mini USB which is opened by a download called Moveslink. Initially I had some trouble getting the watch to connect to the USB. This was because I had my Garmin ANT Agent running in the background. By turning this off the watch automatically downloaded by recent activities in a couple of minutes. 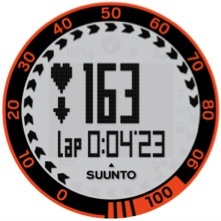 Suunto has an online community similar to Garmin Connect called Movescount. This allows you to analyse your run, store, share and compare with others. There are communities within communities that allow you to set up your own clubs to compare recent performances. Movescount and Moveslink allow you to customise new workouts that can then be transferred to your watch ready for your workout. All in or, these features and the online community is very intuitive with some nice features such as allowing images of your run to be uploaded and added to your data, making your training much more personal. Suunto position this watch as a major upgrade to their previous M-5 Model and as a direct competitor to Polar’s RS300X and Garmin’s 110 models. Having had limited experience of these watches it is hard for me to make more detailed comparisons. But in terms of features and build quality along with competitive pricing of around $330 including the mini FootPod you would still be around $75-125 better off than its competitors. So in summary, if you are looking for a long lasting bomb-proof HR training monitor which when combined with the optional FooPod I feel you have all you would ever need to enhance your training for anything up to a 100km race. Follow the Great Ocean Walk 100km Live! Having tested a lot of watches, in my opinion at the time the web based analysis applications hit the market, professionalism got lost in the ether. First of all if your train in any situations where there is no internet, and your watch’s memory is full, you have to delete workouts in order to save the new one. 3. The data showed on Movescount about your running, is totally off the chart. Firstbeat Athlete or sports software shows a way different numbers, and that is a professional software. Even Suunto admits that the watch, the movescount site, and firstbeat shows different data. It is a heart rate training tool. How come you can lock only one heart rate zone ? For instance in Polar watches you run in any heart rate zone and you can lock it. You cannot upload workouts on the watch. For instance I want to do 20min Warmup/1hour in HRZone 2/ 30min on 5:00min/km pace/14min cooldown in the top of HRZone1. By using the Polar Pro Trainer or Garmin Training Centre it is possible. There is no Altimeter on the watch what is a limiting factor for ultra runners. It is not compatible with Training Peaks nor with Firstbeat. The small footpod is really handy, GPS cannot stay alive for more than 15-20 hours. This has 400hours what is 4000+Km running. The footpod data is very accurate if calibrated, but only on flat road. The changes in stridelength, elevation, and jumps during trail running makes data very inaccurate on the long run. But during a 100miler it is only 3-4K difference, it is not a big deal if you know the course, and not going for the first place. Suunto T6D is highly superior to this watch, but still Polar and Garmin offers a lot more professional service in most of their watches. FR60 from garmin with footpod – I picked up one for my GF for around 60€, perfect watch with nice details, readable screen, no gimmicks. The new FR610 and the 910XT from garmin are expensive gadets but they are really high quality. Polar messed up it’s line with the RC’X 5 as there is no protrainer software anymore, but the RS800CX is still the very best watch in the market, and now available with the new smaller footpod and GPS, also it has altimeter, good Software and brilliant design. Battery life and memory is long. I own a Quest and could not agree more with L3vi. Nice looking watch but laking in HR features and Movescount is a nightmare. I’m tossing up between Garmin FR610 or Polar RS800CX as replacement.